Some teams match up extremely well against others and own that team's number. Simply put, the Utah Grizzlies have the Wichita Thunder's. Following a three game sweep in Wichita in November, Utah exchanged blows with the visitors Saturday night at the Maverik Center. 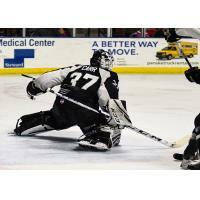 But despite Wichita's best effort to date against Utah, Grizzlie goalie Kevin Carr stood tall and when the final buzzer rang, the Grizzlies had defeated the Thunder yet again, this time to the tune of 3-1. It was Utah's fifth victory against the Thunder in as many contests. "The guys played really well in front of me and kept most of the shots to the side which makes my job easier," Carr said. "We've got to bring that same effort tomorrow night. They're a good team and we respect them just like every team in this league and we're playing the right way which is why we're having success." Although the Thunder controlled the puck and pace of play for the majority of the second period, each team manifested a goal. Utah's power play, until recently non-existent, has come to fruition the last few contests. Tim McGauley fired a one-timer past the outstretched arms of Stuart Skinner, who played much better than he did Friday night in which he was pulled in the third period. Carr was playing superb in net but he wasn't able to prevent a breakaway in the second period. Thunder forward Jesse Gabriella chased down a loose puck and fled down the ice, firing a rocket between Carr's pads. Grizzlie forward Mike Economus is known for his enforcement and fighting on the ice but not for his goal scoring. However, the forward was able to notch his first in a Grizzlie uniform, garnering a 1-0 lead for the home team. And by the time Jack Walker buried an empty netter to complete the scoring, Wichita was left bowing its' collective heads yet again. "At the end of the day we were able to keep them to the outside and clear rebounds," head coach Tim Branham said. "We have to bring a better effort Saturday but we found a way to get two points and good teams do that."